-Atmospheric darkened Metal solo project. -New entity of a Bone Awl member, highly recommended! -16 years after the recording of cult first demo they return with a debut full length album of underground Polish Dark/Black Metal. -Colour cover edition released by Czertog Production in collaboration with Necrolust distribution. -Grim and evil Black Metal. -Re-release of their 1996 and 2001 demos on vinyl, highly recommended! -Black Metal from Iceland, released by Terratur Possessions. -Greek Black Metal in a great looking gatefold sleeve, featuring Iapetos of Unholy Archangel. -Raw and relentless Black Metal, this album is a philosophical journey into the darkest depths of humanity and the unknown future of our species. -Deathgate Arkanum stands for creativity, individualism, consequence without any compromise and evolution without standstill. -Speed Metal Punk Black Rock'n'Roll reminding Inepsy. -Great occult Black metal from Canada, Monarque side project. -Pagan Black Metal with accoustic guitar. -Evil Black Metal with a sinister ambience. -Hateful and atmospheric Pagan Black Metal. -Seven songs of sharp, situalistic yet melodic Black Metal to honor the dead, each copy is dedicated to the owner and handnumbered. -After two promising demo tapes polish Death Metal maniacs Doombringer return with two brand new tracks of unholy Death Metal. -A human voice for nature's lament. -Majestic Black Metal atmospheres and haunted ambience featuring penetrating eerie synths and grim guitars with outbursts of fury. 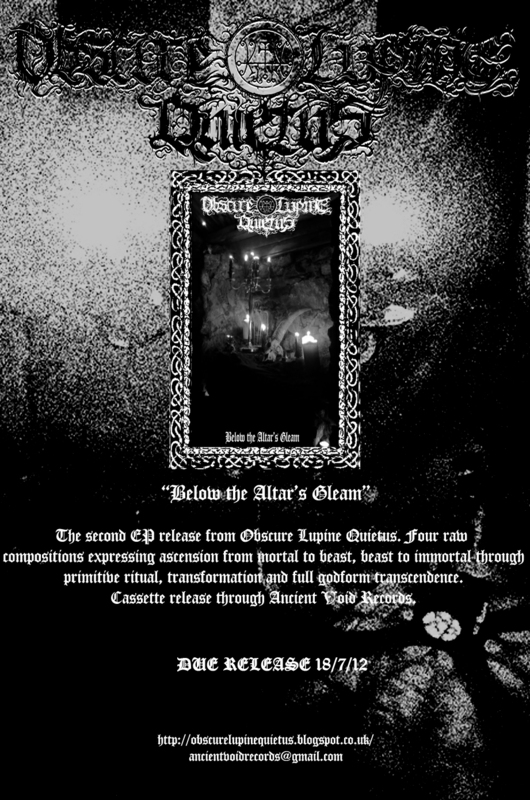 -Debut demo from this new Black Metal horde form the United Kingdom, formed by Nostalggia and Oros of Obscure Lupine Quietus. -Anonymous French Black Metal manifesto. Nostalgic, jaded, breathtaking... Highly recommended! -riginally recorded in November 1992, this promo was released after the first demo, this was truly the beginning for what was to become one of the most hateful Black Metal bands of all time. -Mandatory, one of the best Polish Black metal release of all time. Forever Plaged Records edition. -Solo project of a member from Verglas. Distant and nihilist BLack Metal, highly recommended! -Total old school Thrash Metal including guitar solo that remind of early Metallica from this horde from Bretagne, France. -Crafted during the year of 2011, ushering 9 psalms of obscure, unearthly doctrine to conjure infinite sorrows upon the earth. -If you don't own any official Lord of Evil releases, it's about time you get one. Twelve minutes of extraordinary, fast-paced and extremely grim Black Metal. -Grim, hypnotic, cavernous, and schizophrenically violent in execution, Nastrond eschews the atmospherics of their mid-90's work in favor of harder, grimier textures. -Four raw compositions expressing ascension from mortal to beast, beast to immortal through primitive ritual, transformation and full godform transcendence. -Four tracks fierce Black Metal. -Raw and hateful Black Metal recorded the way it should be. -Antholgy of all Peste Noire demos. -Back in stock! Fifteen year old Prest re-emerge with a new honest and raw rehearsal recording, released by Daudings Gjenklang. -Back in stock! Obscure and sinister Black Metal on Parasyte Curse. -Underground raw Black Metal, recommended! -Morbid Metal of Death, the essense of darkness. -Grim Black Metal, a masterpiece cold as death. -Back in stock! Raw lo-fi Black Metal with a great atmosphere, highly recommended! -The second full length album of Szron, five tracks of pure Black Metal. -Four tracks of masterfully executed Black metal pressed on to 160 gram 12" vinyl for maximum enjoyment and sound quality. -German and Polish hateful Black Metal. -Pure underground Black Metal from Norway, highly recommended! 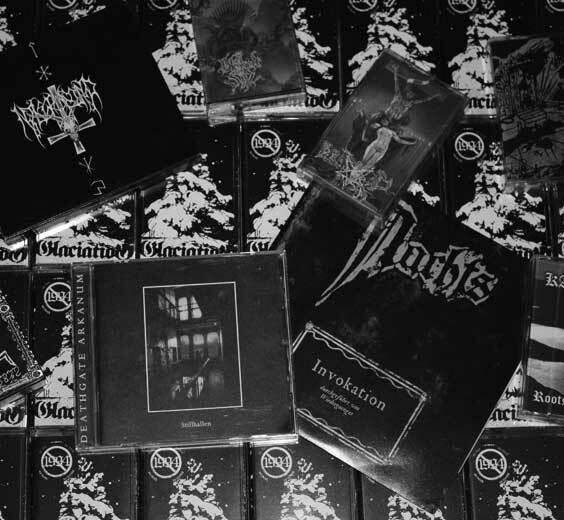 -Obscure and evil Black Metal for the old school worshippers. -Great primitive and occult blackened Death Metal From Finland. -Raw punk induced Black Metal on side A and experiment noise deviation on side B. -Natural, crude and primitive Black Metal produced by Versets Noirs. -Yorkshire Heathen Black Metal on Seedstock Records.